Do you feel like you’re constantly explaining content marketing? Whether you’re seeking initial buy-in or justifying an existing program to a new executive, you’re often asked to prove that content marketing is a worthy investment. Explaining the nitty-gritty inner workings and ROI of content marketing to bosses or clients is difficult. But it’s necessary. If you can’t get support behind your content efforts, how can you be successful? So, how can you explain content marketing and its potential ROI in a way that’s persuasive, urgent, and incredibly convincing? Fear not. You can make it happen. Explaining ROI starts with making sure executives understand the definition of content marketing and how it will get your brand to achieve goals. 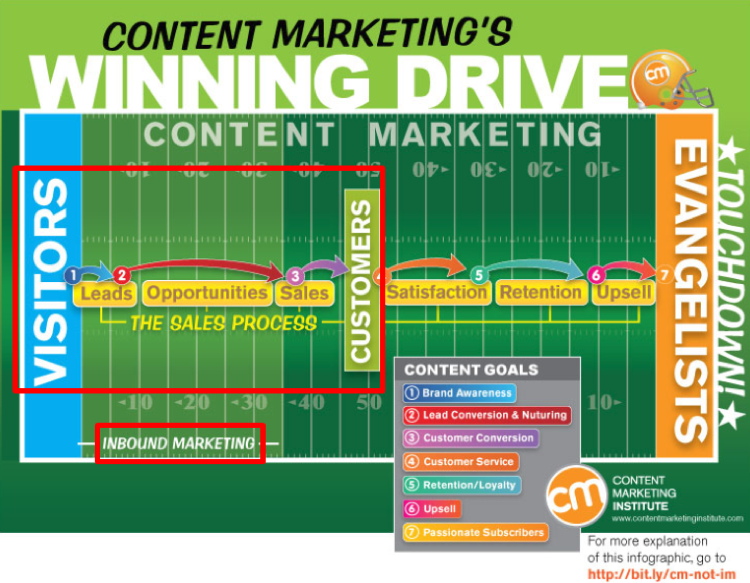 Content marketing is a vehicle, and content marketing strategy is the engine. The vehicle takes you to your destination only if the engine is in good shape. For example, if your goal is to increase organic traffic to your website, that’s the destination. Your content marketing strategy that calls for crafting a blog and posting three times a month targeting keywords your desired audience is using to search, that’s the engine. The content crafted for those posts is the vehicle. Breaking down content marketing and content marketing strategy using an easily understood metaphor gives your bosses or clients a ground-floor understanding of how it all works. After you lay it out, though, you need to dig in and really show them why it works and why they should care. All the metaphors in the world won’t help you explain content marketing ROI if you’re not speaking a language your boss or higher-ups understand. To drive home the impact and potential of content marketing, show them the money (metaphorically). Gather examples of other businesses that have used content marketing to bolster their brand success. In particular, search for case studies that show gains from content in terms of hard data. 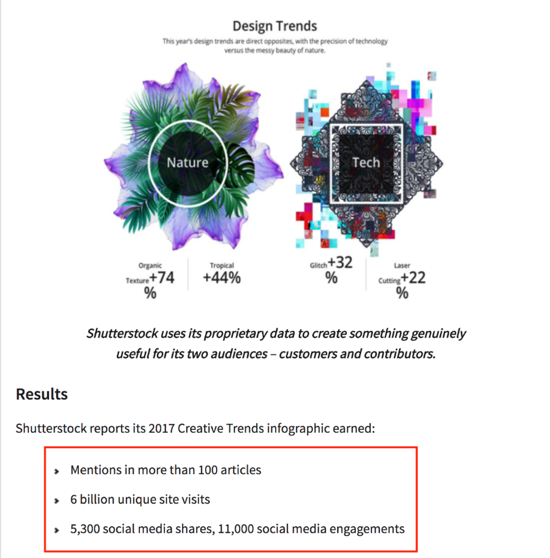 For example, Leslie Carruthers’ article, 4 Case Studies Show How to Crush It With Out-of-the-Box Content Marketing, details how four brands found success with their content marketing campaigns, including some of the results. Most business leaders want to know the kind of results to expect from the marketing strategies in which they invest. Case studies and examples show them what’s possible. But don’t just gather all the examples possible and put them out there. Think about the people you’re trying to convince and choose the examples most likely to appeal to them based on their role and goals. If executives want to know what the ROI of content marketing strategy will look like in hard numbers (and many do), don’t despair. You can provide a model for predicting what kind of payoff to expect based on the initial investment. This is how you literally show them the money. 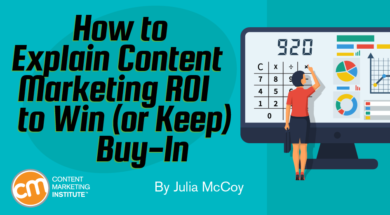 Conversions form the foundation of the content marketing ROI model and offer a basic metric to determine whether a content marketing strategy is successful. If you quantify conversions in terms of potential for sales, you can predict the eventual ROI from investment in a content marketing strategy. If you are looking to justify your current content marketing strategy, you may already have these numbers. If you’re working on initial buy-in, you need to make some assumptions. 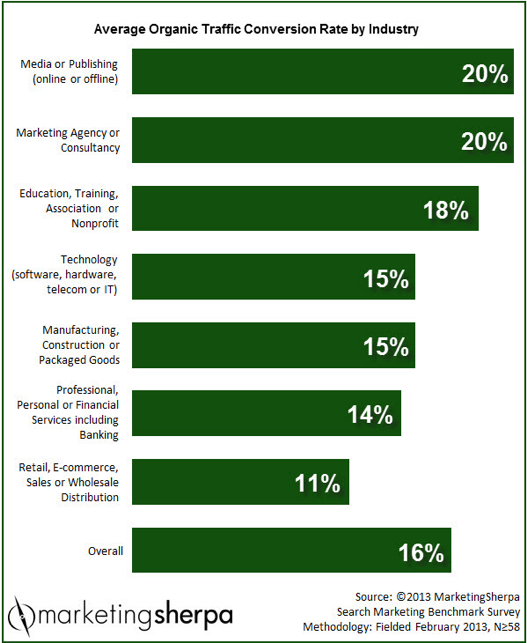 I offer some possibilities based on existing data from a MarketingSherpa study, but you may find data more specific to your industry or goals. Plugging these figures plus estimated monthly traffic numbers into the content marketing ROI formula will show projected leads and sales. Estimate earned leads per month: number of monthly site visitors multiplied by 16% (average traffic-to-leads conversion rate) equals number of leads/month. Estimate sales per month from those leads: number of leads/month multiplied by 14% (average lead-to-sale conversion rate) equals number of sales/month. Now, let’s plug in traffic numbers and see what the formula predicts for sales. I’ll use a monthly traffic number from my website – 15,470. Earned leads/month estimate: 15,470 (visitors) multiplied by 0.16 (average traffic-to-leads conversion rate) equals 2,475 leads. Earned sales/month estimate: 2,475 (leads) multiplied by 0.14 (average lead-to-sale conversion rate) equals 346 sales. In this example, the ROI formula predicts nearly 2,500 leads and approximately 346 sales. Be up front about the assumptions inherent in the formula. Your conversion rates will vary and once you have real numbers to work with, you can tune the model. You might be asked to explain whether content marketing is better than paid marketing or paid search tactics. This is the perfect opportunity to compare these investments and show why content marketing comes out on top. Here’s how. Up-front investment is always necessary. For example, if you outsource to a content agency, I estimate you’ll pay about $375 on average for one authority content piece. If you need one piece per week, that’s a monthly investment of $1,625 ($19,500 annually) for strategic content writing/creation. In exchange for a strategic content marketing investment, what will your company or client get? For example, the content creator will focus on 52 high-performing keywords (low competition, high search volume) for your brand and strive to create content pieces that rank at least in the third position in Google search results for at least two-thirds (34) of your targeted keywords within a year. 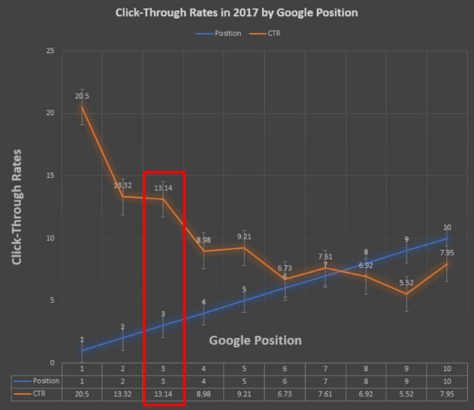 Each keyword achieving a top three position has a search volume of 1,500 per month and a click-through rate of 13.14%, according to data from Ignite Visibility. The high-performing content would appear in a total monthly search volume of 51,000 (34 keywords multiplied by 1,500 searches) and average of 6,701 monthly visitors (51,000 total searches multiplied by .1314 CTR). Your monthly investment of $1,625 could net 6,701 visitors at a minimum to your site. Paid search to achieve that same traffic in a month would cost $17,000 – 10 times more expensive than organic content marketing (that figure is calculated for this example based on SEMRush data for my site). Or put it another way – the content marketing strategy is 10 times cheaper than the paid marketing strategy. For business owners and higher-ups who think exclusively in dollar signs, that’s convincing. 6,701 (monthly visitors) multiplied by 0.16 (average traffic-to-leads conversion rate) equals 1,072 monthly leads. 1,072 (monthly leads) multiplied by 0.14 (average leads-to-sales conversion rate) equals 150 monthly sales. In this example, a monthly investment into the content marketing strategy of $1,625 would lead to 150 sales. Lay out a ground-floor explanation of how content marketing works using relatable metaphors. Present examples of content from various companies and the results netted from these campaigns (use hard data and statistics). Use the formula above to show the brand’s content potential for ROI conversions. Compare these numbers to investments in other marketing tactics to get the same results. Then, get ready to accept handshakes and pats on the back for your marketing genius. Make the case for your executives to invest in making your brand’s content marketing strategy even more effective. Get them to send you and your team to Content Marketing World Sept. 4-7 in Cleveland, Ohio. Register today and use the code BLOG100 to save $100.